Since its original publication in 2009, "Artisanal Gluten-Free Cooking" has steadily grown in popularity as more and more home cooks have discovered - and enjoyed - the Bronskis' high-quality (but not too complicated), from-scratch recipes for delicious gluten-free fare. This expanded and updated edition, now four-colour throughout, includes 50 all-new photographs, 25 new recipes such as Penne a la Vodka, Bagels, and Red Lentil Dal, and more nods to vegetarian and vegan eaters. As before, recipes draw on cuisines from around the globe - Italian, Indian, and Mexican among them - and include both sweet and savoury dishes, from breakfasts, soups, and salads to entrees and desserts. "Here is your one-stop shop for gluten-free cooking and baking. Breakfast, lunch, or dinner--you're covered. 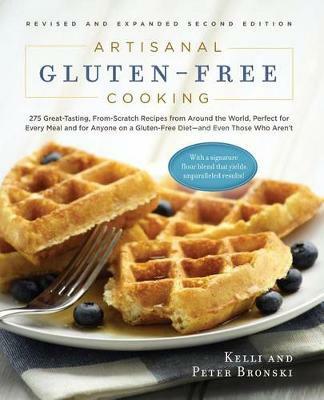 In Artisanal Gluten-Free Cooking, Kelli and Peter Bronski give us a collection of recipes that prove beyond a doubt that going gluten-free doesn't mean sacrificing favorite foods or great flavor." "In this outstanding volume of 250 recipes, Kelli and Peter Bronski share tips, tricks, and favorite dishes . . . While recipes are uniformly excellent, Asian dishes are particularly toothsome . . . Gluten dodgers will also be pleased with the Bronskis' pizza recipes . . . The duo seem to have thought of every craving and indulgence, serving up cr me brul e and cocktails, too; it's also worth noting that plenty of recipes don't call for special ingredients at all . . . This volume's impressive breadth and straightforward instructions make it an essential, horizon-broadening tool for those off gluten." "Artisanal Gluten-Free Cooking by Kelli Bronski and Peter Bronski focuses on simple, from-scratch home cooking. Along with loads of easy-to-follow, family-friendly recipes, the Bronskis have also developed a gluten-free flour blend that truly tastes delicious (I can vouch for the apple pie!). A guide to navigating the supermarket, product recommendations, and gluten-free resources make this book a useful and informative addition to your cooking arsenal." "An indispensable guide for the creation of tasty meals." "Flip through [Artisanal Gluten-Free Cooking] and you'll find plenty of recipes that are not only beautifully prepared, but easy to cook . . . This book is an absolute must-have for anyone who wants to maintain a gluten-free diet without sacrificing taste." "Treat yourself to a delicious gluten-free culinary excursion for any meal of the day with Artisanal Gluten-Free Cooking. Celebrating sweet and savory scratch-recipe traditions, Kelli and Peter Bronski feature a must-have treasury of recipes that anyone can savor. This book connects you with the true essence of artisanal gluten-free living. Enjoy!" "Like no other gluten-free cookbook, Pete and Kelli's Artisanal Gluten-Free Cooking touches on the essential elements of why food, culinary culture, and family traditions are so important. What we eat is part of who we are. When a diagnosis of celiac disease or gluten sensitivity forces us to eliminate a key ingredient, preparing our favorite meals can become difficult and frustrating. This book reminds us that all we need are fresh, wholesome ingredients and a little creative guidance. Thank you, Pete and Kelli, for providing that guidance. The principles of good cooking, complete with mouth-watering recipes, are woven throughout the pages of this book. Oh, and they just happen to be deliciously gluten-free!" "Kelli and Peter Bronski have made more than an amazing gluten-free cookbook. They've made an amazing cookbook all the way around, gluten-free or not. This cookbook is about more than great gluten-free food. It's about great food, period." "Artisanal Gluten-Free Cooking is a true delight. It's filled with uncomplicated recipes you'll want to make-- whether you eat gluten-free or not. But, my favorite aspect is that the authors share their history with each dish . . . like homemade French fries using mom's method; a unique scallop dish first tasted when dining out, now improved and shared annually with college friends; or a lemon syrup-infused poppy seed bread inspired by a vendor from the local farmer's market. We all have those histories, don't we? Great food is about so much more than the food itself. You'll want this cookbook on your kitchen shelf, so you can create your own memories with these dishes." "Kudos to Kelli and Peter Bronski! I was impressed and, more importantly, genuinely entertained by Artisanal Gluten-Free Cooking. Peppered with great information throughout--from world food trivia to essential kitchen advice--this cookbook reads as if an old friend is talking you through a cherished family recipe over the phone. Filled with intuitive, straightforward, and delicious dishes, the recipes will empower any passionate cook to create seasonal, healthy, and 'from-scratch' dishes with the added bonus of avoiding gluten. This is a must-buy for anyone who hosts frequently, and certainly a no-brainer for those following a gluten-free diet." "Whether you are new to the gluten-free diet or have been gluten-free for years, Artisanal Gluten-Free Cooking is a must-have guidebook. Kelli and Peter Bronski share an impressive compilation of mouthwatering gluten-free recipes, as well as sage advice on successfully navigating and maintaining the gluten-free diet." "Of the many cookbooks that I have received to add to our support group library, Artisanal Gluten-Free Cooking is the first one that I sat down with and went through, cover to cover. That is partly because I found the format and the presentation so appealing, and also because the recipes just sounded so darn good. Like you, I love cilantro, garlic, and many of the other ingredients that you use in your recipes--and I appreciate that you don't require too many exotic ingredients. I think you have a winner on your hands!" "A whole book of doable, mostly simple recipes that anyone can cook. They have all kinds of familiar foods in here that I always want to make but need a good recipe . . . You can make all kinds of goodies with this quite extraordinary cookbook. It would be great for anyone, but especially for a newly diagnosed celiac who may be struggling with menu ideas and how to make them on their own. Trust me, you won't be disappointed in this cookbook. It's worth having on your shelf just for the pastry dough recipe." "This book is inspiring, personable, friendly, and makes you want to cook. You'll want to go to Peter and Kelli's for dinner, too. Recipes are easy, and not intimidating." "A cookbook with recipes that actually make me want to learn how to cook . . . The cookbook for those of us who might not know how to cook, but who want to learn." "Your cookbook arrived yesterday and I must tell you, IT IS GREAT! I love to cook and have over 100 cookbooks, and probably 20 gluten-free cookbooks, but yours is the best! I'm impressed with the variety of everyday foods made with fresh ingredients and the pictures--beautiful!" "I love how Kelli and Peter have taken international foods and shown how to make them gluten-free!" "Lots of good information--especially for new celiacs. Your recipes are outstanding!" "The recipes that intrigue me most are the variety of pizza recipes . . . yes, I said variety!!! Get this . . . Deep Dish, Thin Crust, New York-Style, Chicago-Style . . . PIZZA!" "The snickerdoodle recipe reminds me of the ones I used to make before I had to go gluten-free. Yum!" "This is a seriously good book. I love it! The tacos were AWESOME! Last night I made the chicken cordon bleu. Very good. The sauce was delicious." "I just made your mozzarella sticks. The kids loved them. [My husband] and I found them as good as any we had gotten at restaurants in our pre-gluten-free days."